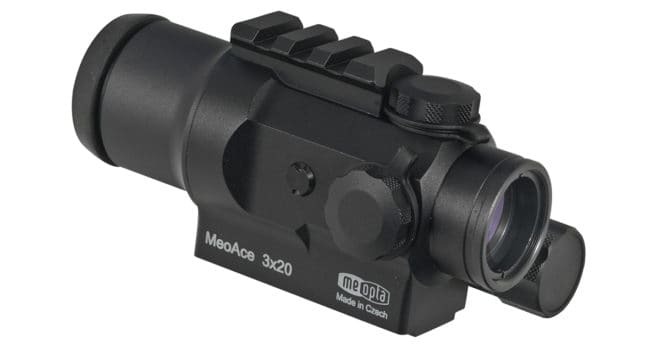 After having rolled out and announces a number of new scopes and sights, Meopta also announced the new MeoAce 3x20 Tactical Sight. It comes with an illuminated reticle that is designed and matched for shooting with rifles that use the 5.56 NATO and the 7.62x39 NATO. Alternatively, it can be used for the 7.62x51 NATO or 180gr .308 Win when you use the 5.56 specific reticle. The reticle options and the sight are designed to work for ranges up to 400 meters. The sight is built quite compact and the ‘Ace’ in the name stands for Aiming Compact Equipment. The sight measures just over 5 inches in length! The reticle features 12 intensity settings which allows you to adjust the brightness to your surrounding light and visibility. It also is compatible for night vision so you can confidently shoot during evening and late night hours. The sight is designed to withstand heavy recoil. The optics feature Meopta’s proprietary MeoBright multi-coatings. These treatments and coatings are meant to reduce reflection and glare. The lenses are also treated with the MeoDrop coatings which provides protection for the glass from the environment like water (rain and snow) and dirt. It also repels oils from skin and grime to provide you with the best visual possible in all circumstances. The Meopta MeoAce 3x20 is supposed to be available for purchase in February 2018. The MSRP is set to $ 1,299 but it is expected that the street price will be lower.